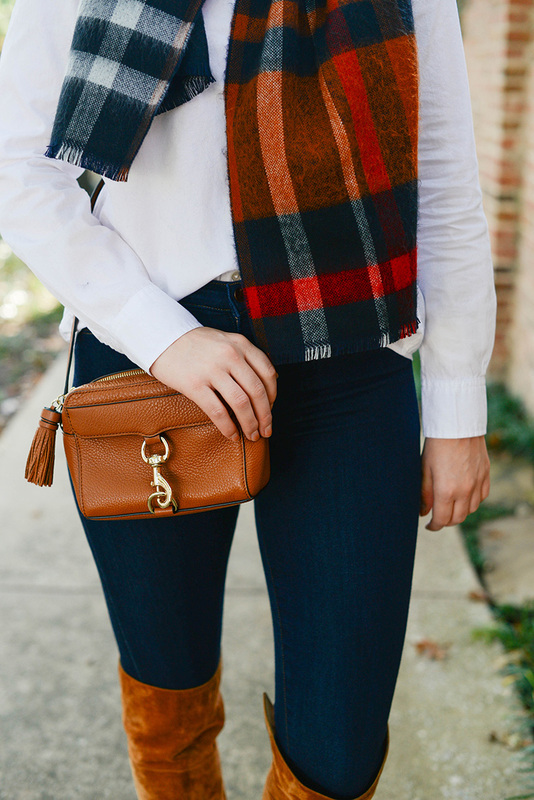 I’m such a big fan of plaid and check prints this time of year… anyone else? They really are the perfect holiday prints. I love all the colors and cozy fabrics, and they are such easy prints to incorporate with stuff you already wear! 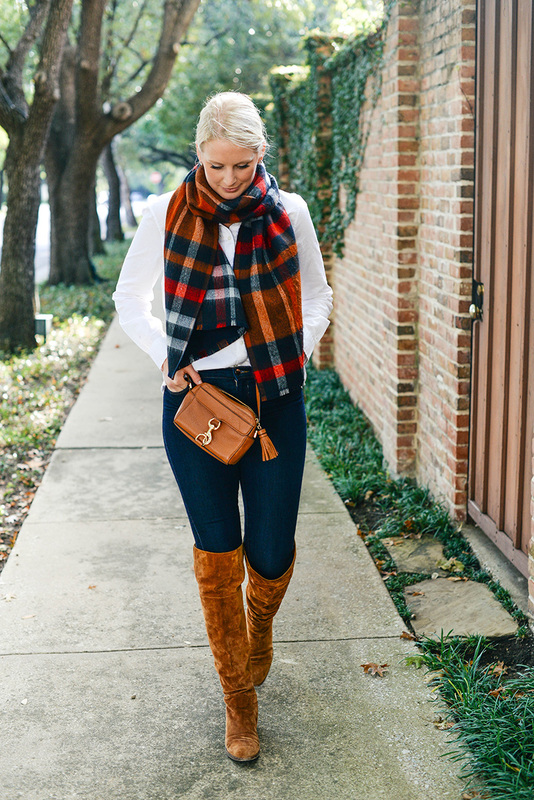 This time of year you can count on me living in jeans or leggings, over-the-knee boots and some kind of sweater or blouse (depending on how mild Texas winters are). 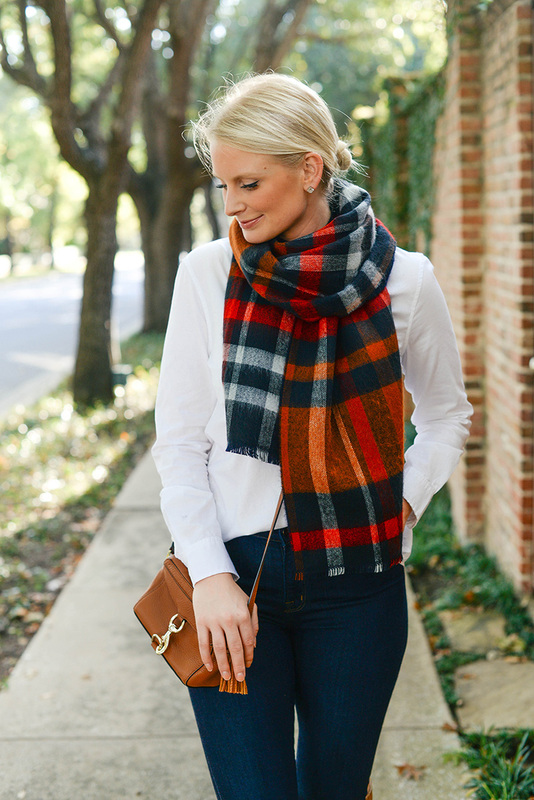 Cozy scarves like this one are a beautiful way to incorporate a holiday theme without looking like a Christmas tree. Plaid is a print you can absolutely wear to work too, just as long as the colors aren’t crazy loud or the print is super distracting from the rest of your ensemble. 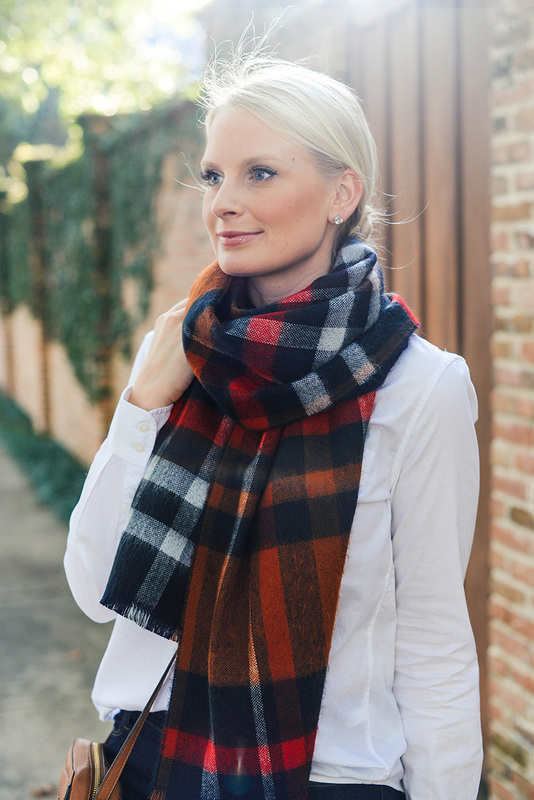 This plaid blanket scarf is only $28, and features the richest autumn color scheme I’ve ever seen! So perfect for Thanksgiving day. Going to the A&M game on Thursday? This scarf is a clear winner in maroon. 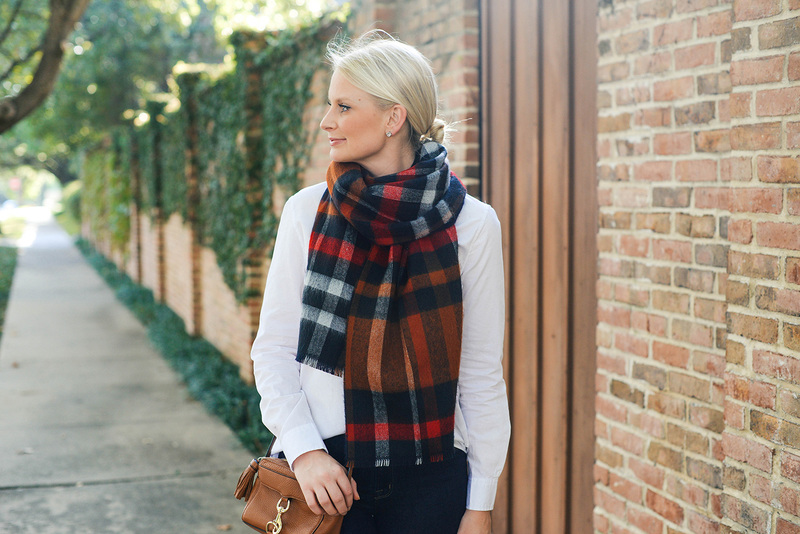 This subtle plaid scarf is one you could easily wear to the office – the neutral color scheme looks gorgeous against black, grey, navy and white! For something with a bit more Christmas coloring to it, try this one. It’s also $25 – such a steal!! This BP scarf is literally called the “Autumn” scarf, and for good reason. Such stunning colors! you look stunning and that plaid is so pretty. I do love the rich color of that plaid scarf! This outfit is perfect for Fall! 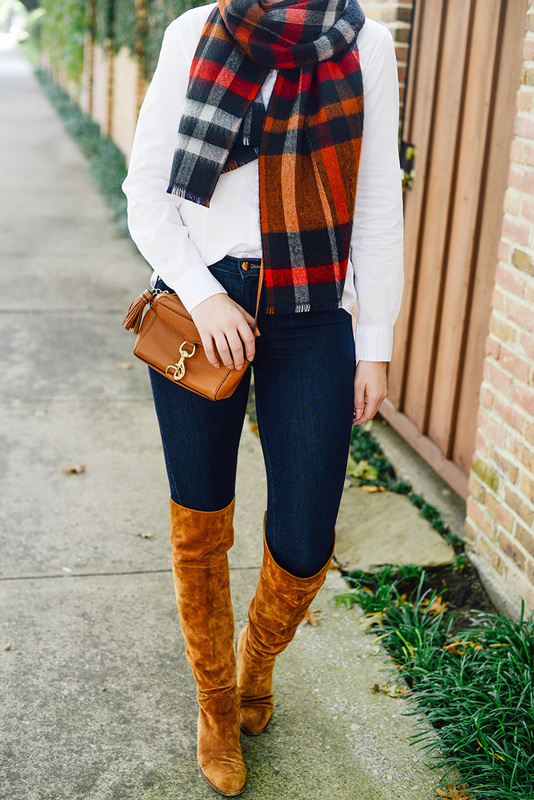 Obsessed with your scarf and boots! I love the colors. Such a great look! Love the colors in this scarf! Such a great fall staple, can’t wait to see the ones you picked up while abroad! I really love this scarf – so perfect for fall with the orange shades but enough of the red to make it festive for the holidays. Kind of the perfect combination of colors! Such a great fall color palette. You look great. I like this outfit, especially the boots. When it comes to scarves, I have a ton and rarely get to wear most because as you know here in Houston we dont get much of a fall and winter. It’ been in the 80’s all week, until tonight when we got some rain. Tommorrow high is suppose to be 64, so I may have to whip one out. Feeling optimistic and inspired.